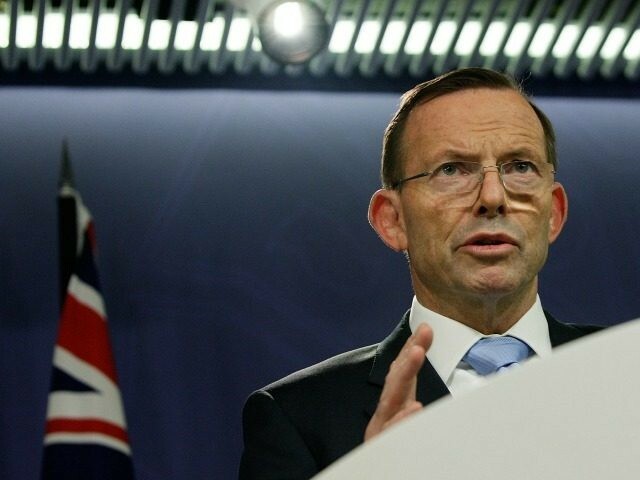 Britain should “get on” with leaving the European Union (EU) and have a comprehensive free-trade with Australia ready for the day Brexit formally happens, former Australian Prime Minister Tony Abbott has said. Mr Abbott told a business breakfast in London on Monday “there should be no tariffs or quotas whatsoever on any goods traded between our two countries — there should be no exceptions, no carve-outs, nothing.” He also urged the free movement of people between the UK and Australia, enforcing long-standing Commonwealth ties. Mr Abbott went further during his speech at the UK/Australia Chamber of Commerce. “The objective would be an entirely seamless economic relationship based on free entry of goods, mutual recognition of services and standards, and easy entry of qualified people. “If a motor car (say) could be registered in the UK, it should also be registrable in Australia. “If a trade qualification (say) was recognised in Australia, it should also be recognised here. “After all, British and Australian workers enjoy similar protections in the workplace so why should they need elaborate protections against each other? Mr Abbott pronounced himself an enthusiastic convert to Britain’s decision to leave the EU and besides the new doors opening for global trade, he applauded British voter common sense in taking back their country against all the naysayers who predicted disaster. “Post-Brexit, the stockmarket’s up, employment’s up and economic growth is up; the pound’s down, but that should more than compensate for any tariffs that the EU is foolish enough to impose,” Mr Abbott said. He then pointed to Australia’s success in negotiating a multitude of trade deals as a template for the UK’s own future. “When it comes to trade deals, no country has had more extensive recent experience than Australia. My government finalised free trade agreements with Korea, Japan and China. Mr Abbott’s parting words reinforced his desire for Australia and the UK to reconnect, saying “freer trade is a really important economic reform waiting to be grasped by a country that wants to be more open for business”.